Department of Justice issued an advisory telling telecommunication business firms to make their advertisements transparent and notify their consumers on their right to be informed with regards to the details of the internet and data services being offered to subscribers. The nine-paged advisory released on Wednesday, by Office for Competition under the DOJ says that telcos could be charged with administrative charges if they are found to break the Consumer Act and Public Telecommunications Policy Act also known as RA 7394. As clarified by OFC, unfair trade practices includes those advertisements that contain deceptive, false and misleading information. These advertisement can cause not only financial injury to the consumer but also to the economic market as well. OFC Sec. Geronimo Sy also added that the broadband speed levels must not only state the maximum (up to) speed but the minimum speed as well since the telcos expect promt payments from the consumer. 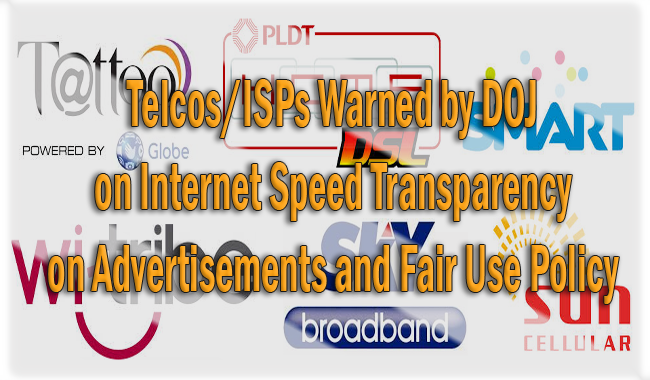 The internet Service providers (ISPs) lure the consumers with affordable prices even though the internet connection speed provided was in reality slower than advertised. The telcos uses a lot of advertisement mediums such as posters, radios, TVs and web posts advertising the maximum speed level of the internet connection that they could provided, using the phrase ‘up to ---mbps’, leading the subscribers to believe that they would actually have such internet speed, when in contrary, they get the opposite. The OFC says that the telco firms must include the minimum speed, service reliability, details on data usage and additional charges and other conditions that gives the consumers the right information before availing their services. The companies fail to honestly tell the consumer the Fair Use Policy, also known as data cap, which is the limit of data a person can use even though he is subscribe in an ‘unli’ data promo. Read Sun Cellular’s FUP here.